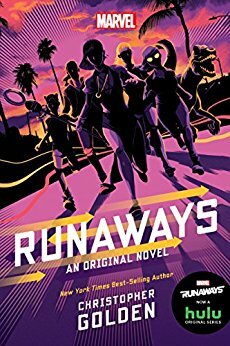 I'm not totally sure what “Original Novel” means to the bigwigs at Marvel, but that's the slightly misleading phrase they're using to describe Christopher Golden's new book Runaways. (I guess “Transparent Cash Grab” didn't fit on the cover.) Golden's book doesn't seem to be a direct relation of either the rebooted comics or the recent TV adaptation, but rather a story that branches off from an early volume of Brian K. Vaughan's original series. That means it's impossible to review it without spoiling something, so please take heed: MAJOR SPOILERS AHEAD. Golden's story opens shortly after the deaths of the Pride and the discovery of Alex's true nature, but before the departure of Gert. The Runaways are sticking to their mission: taking care of one another, staying out of foster care, and rescuing the odd teenager from the sudden influx of new supervillains scrambling to step into the Pride's shoes. When they rescue a pair of kids from an uncomfortably familiar-seeming group, Nico, Karolina, Molly, Chase, and Gert are forced to realize that their parents' influence might have spread well beyond the boundaries of Los Angeles. This is an entertaining but flimsy read, complete with enormous font and extra-wide spacing. (Thankfully, it's only $10.99) Golden is a competent writer, and solidly delivers on the characterization and fight scenes, even if his plot is fairly predictable. I suspect fans of the TV series will find more to enjoy here than fans of the original comics—rather to my surprise, the TV show did a worse job than the comics did of developing the characters' relationships, so TV viewers might find Golden's version more satisfying. (Comic fans will have fun, too, but the romantic and familial stuff won't come as such a surprise.) But everyone will have to accept that it's all happening in a slightly different 'verse than they one they're used to, and I have no idea if it will ever tie back in to the other versions of the story.